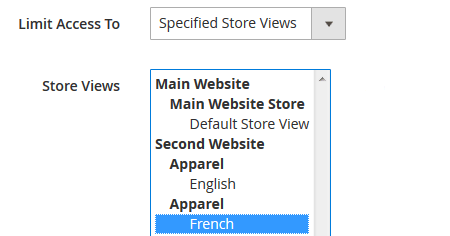 Run a huge Magento store with a rich product catalog, numerous admin users and multiple store views? To keep all items over control and effectively manage sub-administrators let them see and edit only particular products, categories, store views/websites, pages and detailed Magento 2 reports. With the Advanced Permissions Magento 2 extension you can easily create admin roles with a custom set of permissions and assign them to corresponding store managers so that they will get a limited access to backend tabs and will be able to create and edit RMA requests from the backend. Let the existing admin users create the new ones and limit their ability to assign user roles. With the module, you can define the list of roles that a particular user can assign to the new users. The Magento 2 advanced permissions module enables Super-admin to choose which products can be edited depending on the store view/website. Limit the access to reports depending on sub-admins' roles to make them see the information they really need. The option will help you to keep your store data safe and properly updated. Let specific admin users manage only particular categories. Configure the Magento 2 category permissions so that the user will see all store categories, but will be able to edit only specified ones. The Magento 2 user permissions tool enables you to restrict the access to particular CMS elements (pages, blocks, widgets) for different admin roles. The Advanced Permissions for Magento 2 extension allows you to limit access to attributes for certain user roles. Moreover, you can specify the desired list of attributes available for each role. 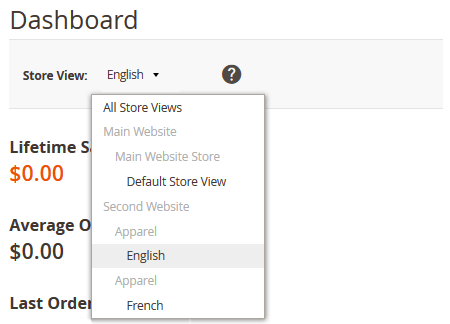 Magento 2 admin permissions extension also allows you to restrict the display of Dashboard statistics according to store-view and website permissions to provide your managers with relevant data and protect important store information. Once an admin user creates a product, he/she automatically becomes the product owner. The super-admin can easily change a product owner right on the corresponding product page. Looking for frontend Magento 2 catalog permissions? Apply a differentiated approach, change the visibility of particular category & product pages based on customer groups with this Magento 2 category permissions extension. Restrict catalog access for non-registered clients and motivate occasional visitors to create new user accounts on your website. Adjust price visibility by customer groups in your Magento and replace it with any CMS block instead. We have several departments and consequently many people that work on our site. To avoid problems with changes caused by mere human error, we decided to use this module. Now we’ve been using this extension for about a year. Everything works fine, no major issues, no bugs. Actually, the module has so many functions that you hardly need to use all of them. Huge module w/ many functions. But nothing stopping us to use it only to limit access to admins. Though, we faced performnace issues soon after installation. But the support solved it in a week or so. 1- ¿Qué tan adaptables son? ¿Se pueden modificar/personalizar fácilmente? 2- ¿Tienen fecha de caducidad? 3- Al actualizar Magento se deberán actualizar todos los plugins, ¿se deberán pagar otra vez? 4- ¿Los plugins se deben actualizar cada x tiempo? ¿tienen costo estas actualizaciones? 5- ¿Cuál es el soporte que debemos tener de este plugin? 1. The module has flexible settings and can be easily fine-tuned depending on your requirements. In case you need and additional customization please contact our support department. 2. Amasty offers 4 months of free support and updates for products purchased from us. Optionally customers can order extended support when buying the module. Once the 120-day and extended support period is over, it is possible to get an update for 50% of the module price - this includes another 120-day period of free updates and support, with the possibility of paid extension for a longer period. Great extension. As suggestion for next version, I would like to propose possibility to add more than one role for user. Currently there is no possible to do that. Please please integrate your wondeful extention with any IP adress extention or add restriction by IP. This can help a lot. Thank you. If you add this I will change to 5 stars surely. – Improvement: the part of the extension code related to saving and editing the store view/website scoped entities was refactored. The stability of the extension was enhanced.